If you have any questions or suggestions you are welcome to join our forum discussion about Types of Orders in the Forex Market. Let us imagine an investor, intending to start trading currency pairs, who has not yet opened an account at a certain brokerage company. He/she should, firstly, make his/her mind what type of financial intermediary services he/she would need, as choices usually include opening an account at a full-specter service brokerage firm, or at a ”discount brokerage firm”. Some investors may decide they are in need of services, offered by both brokerage firms. If the investor pursues advice or wide-scale analysis, he would probably ask for assistance at the brokerage company, offering full-specter of services. If the investor has made a decision of purchasing a concrete financial instrument, he would probably use purchasing and selling services from a brokerage firm, specialized in this sphere. Something, which any investor should have in mind is, that full-service brokerage firms will name a higher price for their intermediary services. The procedure of opening an account usually is as follows. The brokerage firm will require filling a specified form, similar to that, concerning opening a bank account. The form is to be filled and sent back to the brokerage company along with a check. This form will be processed by company’s administration and in a few weeks time it will be sent back to the investor with details of the account, including account number. With this already done, the investor may now call an expert from the brokerage firm and send purchase orders. As far as types of orders are concerned, there are usually several orders, used the most – market orders, limit orders and stop orders. First and probably most popular order is the market order. If the investor submits a market order, that means he/she requires his/her broker to buy or sell currency pairs at the best possible price for the moment. Market orders will always be executed. What’s specific about them, however, is that these orders will not likely be executed at the price the investor prefers or expects. Let us provide an example. An investor intends to purchase a certain amount of units of EUR/USD pair. 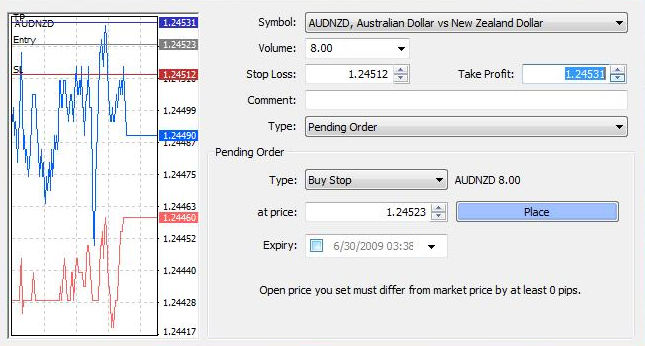 He/she simply calls the brokerage firm and the expert on the phone announces, that currently EUR/USD is trading at a bid value of 1.3471 and ask value of 1.3474. The investor submits a purchase order of 1 000 units of this pair to the broker. 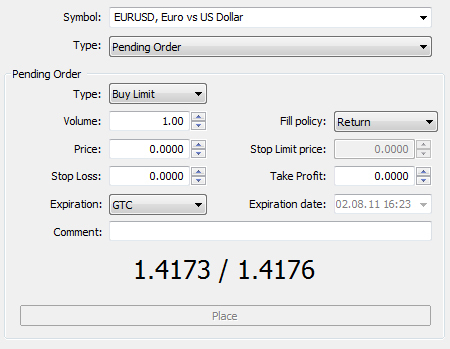 A bit later the broker calls back and informs the investor that he bought 1 000 units at the value of 1.3477. It seems that pair’s value increased during the time interval between submission and execution of the market order. Of course, investors should have in mind the order could have been executed at a lower value, 1.3470, for example, if sellers were more than buyers at that moment. The limit order is another often used type of order. When submitted, this means the broker will buy or sell a defined amount of units of a given currency pair at a defined or better value. If this value is not in the current market price range, then it is usually considered ”away from the market” and will be registered in the so called book of orders below the other active orders. This means that other investors submitted their limit orders earlier and all registered orders will be filled in this current placement. This is not a rare situation, so any investor should take note that, actually, there is no guarantee that limit orders will ever be executed. Before making a decision whether to use a market of limit order, every investor should be aware of advantages and disadvantages of both the ”guaranteed” order execution, which could be different than expected, and paying the preferred price, but not knowing whether the order will ever be completed. This is a conditional market order, which is activated as the investor makes a transaction at a price, predefined by him. Stop order to buy is transformed into market order to buy, in case other investors are making transactions at the predefined stop price or higher. Stop order to sell is transformed into market order to sell, in case other investors are making transactions at the predefined stop price or lower. Alongside the above mentioned three types of orders, there are also stop-limit orders. Stop-limit order to buy means that at the very moment trade reaches the predefined price, the order is transformed into a limit order to buy. Analogically, stop-limit order to sell means that at the very moment trade reaches the predefined price, the order is transformed into a limit order to sell. Lastly, investors can submit the so called ”Fill or Kill” orders. They are usually used to trade futures and options contracts, but are also valid in stock trading. These orders are limited in time. For instance, if the investor submits a 25 minute-”Fill or Kill” order, that means the order will be cancelled, unless it is executed in the next 25 minutes. It may be useful if we mention also that practice of trading stocks, on the other hand, knows two more types of orders, which are defined by their time period, a Day order and the so called ”Good Till Cancelled” order. The day order is valid only during the day it was submitted. “Good Till Cancelled” orders, however, are more specific. Until second order by the investor, the broker fills the submitted one, as it can be executed at any time. “Good till Cancelled” orders need to be reaffirmed two times during the year, more precisely – every six months. Stock exchange regulations state, that these should be the last working days in April and October. Next, we will talk a bit more about different derivative instruments, with the help of which currency pairs can be traded.